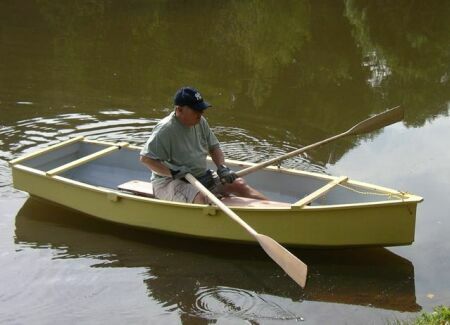 I keep trying my hand at these little rowing boats. The idea is that they will cartop very easily, row quite well with one person and take two adults in a pinch. I also try to keep them somewhat seaworthy and easy to beach. Rogue should be a very good cartop all around rowing boat. I kept her length down to just 10' which should mean that the boat will be short enough to cartop without bumper ties. That gets important because automobiles lost their metal bumpers back in 1990. It will also keep the weight to about 60 pounds for an easy lift to the roof. It should be easier to load than an 8 foot dink because those really short boats often can't be loaded one end at a time - they must be put up there all at once. Even ten footer might be too short for "one end at a time" loading although I know I can load an 11' Piccup Pram that way on a compact car, at least. I kept the capacity up there at about 400 pounds with lines such that the stem and stern are still out of the water. With a light weight hull that should mean the boat might still row well with two adults. One might ask why longer boats are preferred. First, a longer boat can be faster at any loading because when operated at a low power mode, the speed of the boat is limited by waterline length, the longer the faster. That's because long boats make less waves that short boats and those waves are made by your arms in a rowboat. There are limits to the length, of course, but a really serious racing hull might be 20' long or more for a single seater. (I once saw on a college campus a racing boat for a four man crew, over 60' long as I recall. The rowing coach was trying to recruit men to row it, saying he preferred red shirted basketball players - the bigger and taller the better.) And one might remember that there are other elements that cause drag such as skin friction and windage, both factors get worse as boat length increases. I went to multichines with Rogue and would expect her to be a good sea boat for the size, at least when rowed solo. (That is another argument for a longer boat. When loaded with a passenger the weight in the boat gets pushed to the ends and in rough water the boat will not lift itself over the waves but instead pushes through them and that usually slows you down. A longer boat is not affected as badly here.) I'm quite certain that a multichine hull has less drag all around than a flat bottomed boat, although I suspect the V is better yet. The multichine hull is a very good compromise in that it will beach flat and have draft somewhere between a flattie and a V bottom, everything else being equal. 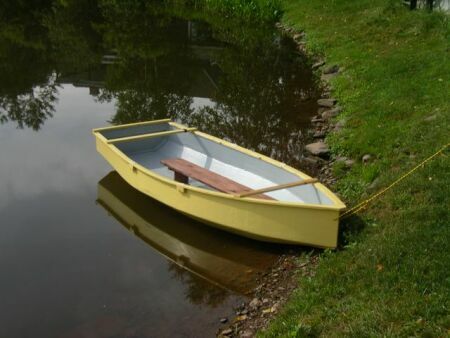 My first rowboat, Roar, had a hull like Rogue, but was 14' long. I found out from it that a multichine has little resistance to side loads, as in a cross wind. Thus to avoid needing to row in a "crab" in crosswinds, a multichine needs a lot of skeg area and a full length keelson. A successful launch. My daughter and son-in-law just bought a farm and this will be perfect for the 2 acre pond. As you can see I put in the Bolger seat. So far it seems to work well enabling me to easily change rowing positions to maintain balance etc. You can't see it in the photos but I inadvertently installed the keelson vertically so it's 3/4" deeper than spec but doesn't seem to make a difference. I've scratched the idea of a motor but would like to try a sail. Suggestions as to mast placement, leeboard etc would be appreciated. I have aluminum for a mast and bamboo for spars. In all of the above I forgot to mention that it's very east to row and I found that 6' oars work a bit better for me than the 7s. A quick and easy build of a fun boat. Good job, Steve! But when you get to bigger waters be sure to row facing backwards, you can get a lot more power into it than with push rowing. With push rowing you can see what you are about to hit sooner, important on a two acre pond. I talked Steve out of fitting a motor which will never work well with a fine lined stern. Looks like I haven't talked him out of the sail rig yet. With no built in flotation Rogue, like any open traditional boat, will totally swamp in a capsize and you will need to be rescued, you won't be able to rescue yourself. LF Herreschoff in one of his books talks about this - with an open wooden boat that has been swamped you must bail it out before getting back inside by swimming beside as you bail. Then get in over the stern if you can. LF used the word "heartbreaking" as I recall since it was very iffy for anyone to try. If you want to sail, better to try Mixer or Piccup which are only slightly larger but have large buoyancy boxes that will permit self rescue. Construction is taped seam. Three sheets of 1/4" plywood will do it and only two thirds of that ends up in the boat, the rest used as temporary forms that are removed. No jigs or lofting.